This entry was posted on Tuesday, October 11th, 2011 at 12:37 pm and is filed under Art. You can follow any responses to this entry through the RSS 2.0 feed. Both comments and pings are currently closed. 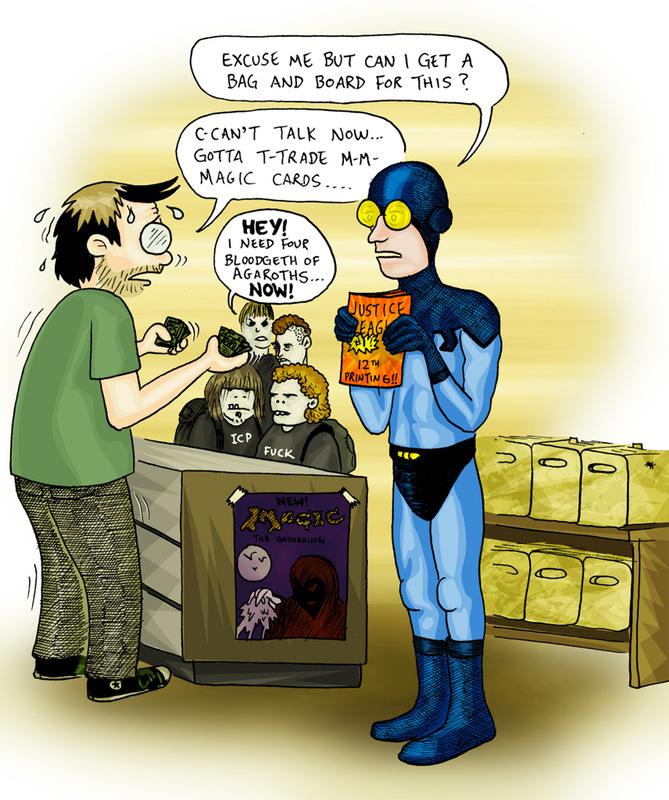 I hate Magic so much that I wasn’t even mad when you turned a drawing of Blue Beetle into a cartoon about hating Magic. Why is Blue Beetle colored white? I thought he was a Hispanic kid. And where’s his armor? i never heard of this “Magic:The Gathering.” and i thought people go to comic book stores to buy COMICS, not trading cards! To Sarah: If only that were still the case. Nice coloring job Eric… I love that palpable haze that’s all around the store… pretty great stuff! Jason- i really like you “Where Wolf” piece for OK Panic. I don’t know anything about the characters but i love how the wolf is biting the ninja person in the leg, and the ninja is screaming (like a little girl, i imagine) and losing his weapons. Hey Jason do you know if Mavericks has that Lotus Fire Troll Fart card in stock, don’t it tap for 12 mana?